The Vintage Village Third Birthday Bash Fair! When: Sunday 8th September 2013, 10.00 am to 4.00 pm. 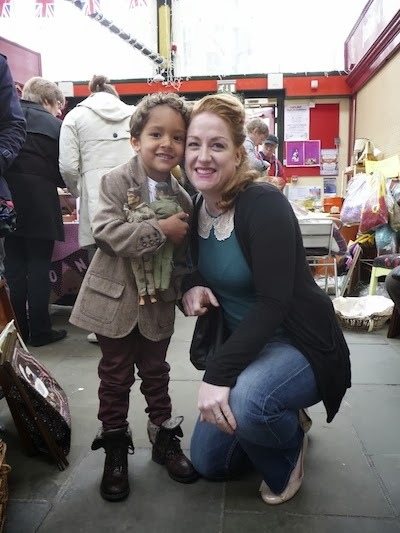 Three years ago we started a little vintage fair, and, three years down the line . . . we still have a little vintage fair! 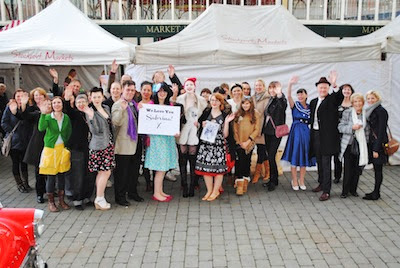 VOTE FOR YOUR FAVOURITE VINTAGE VILLAGE TRADERS! It's high time we recognised the good people who present such a fantastic array of treasures every month. As you browse around the fair, make a note of your favourite traders - the ones who have the best range of stock, attractively displayed, the ones who are friendly and helpful, and remember you and what you're interested in. We'll be giving out voting forms at the doors, and we'll also have a voting form online until the end of September. The Vintage Village Visitors' Awards will be presented at our 13th October Super Plaza Fair. Remember that not all our traders attend every month, so if you want to vote for someone who isn't at this event but you've seen at VV before, that's fine! ★ Ace Tone Revival playing a special set of vintage pop hits from the 60s and 70s! UPDATE: They'll be playing at 11.30, 12.30, and then a bit more if you want them to! 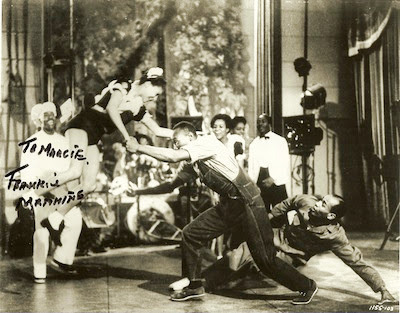 ★ A special all-day matinée in our pop-up cinema of our all-time favourite wacky 1940s musical - featuring the best Lindy Hop dance sequence ever caught on film - the dizzifyingly surreal and hilarious Hellzapoppin'! ★ Kegs & Co will be serving cocktails from a vintage bar! ★ New traders! Please give a warm welcome to Agent Showcase, Cherrie Pie's Vintage Buys, Eclectic Chair and Vintage Marilyn. Top quality refreshments will be available all day from award-winning gourmet British pie creators Lord of the Pies, Kegs & Co, offering US themed burgers as well as tempting cocktails, award-winning master of the sweet treat Stuart Thornley Cake Design and Kandoo Mobile Coffee, the best in the North West! British Beef & Blacksticks Blue Cheese. THIS IS THE SECOND BEST BEEF PIE IN BRITAIN 2013, OFFICIAL! Best of British Mixed Cheese & White Wine Onions. Cheshire smoke Chicken & Ham, soft Herb Velouté. Stockport Pie- Cheshire ground beef, local grown veg and Robinson's Old Tom Ale. Suggested dress code for the day: vintage party! Any era, pick your favourite! Let us know you're coming along on Facebook! Here's our almost-nearly-done list of the finest vintage traders you will find at Stockport's delightful Covered Market Hall this Sunday. Don't forget to vote for your favourites! NEW! Agent Showcase - vintage homeware, collectables, clothes and accessories. NEW! Cherrie Pie's Vintage Buys - vintage women's clothing and accessories. NEW! Eclectic Chair - Manchester based designer and upholsterer; specially designed furniture featuring mid-century modern and antique pieces reupholstered with an eclectic and inspiring variety of textiles. Garbo Antiques - men's and women's vintage and antique clothing, accessories and jewellery. Tons of new stock this month! JK Vintage - women's vintage clothing, costume jewellery, homeware. Lost But Never Forgotten - featuring Ophelia Button: vintage women's fashions and accessories, homewares 1950s-80s; handmade headbands, bow ties and vintagely-dressed peg dolls. Plot 61a - bargainous vintage kitchenalia, homeware and all sorts of knick-knackery from yesteryear! Step Back in Time - vintage homeware, collectables and memorabilia; antique china, ornaments, glassware, pottery, clocks; some vintage women's clothing. We thought that might catch your eye! Source. A still from the incredible Lindy Hop routine in the 1941 classic film Hellzapoppin', on show at our Third Birthday Bash. Source. 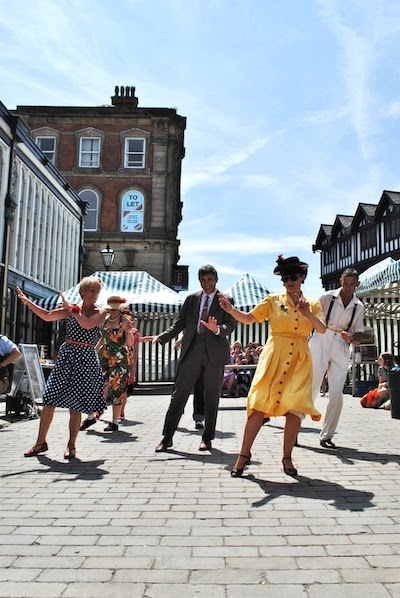 Highlights of the past year: a magical dancing moment from our Yanks in Stockport fair in July, beautifully captured by Frankie Cooksey. Highlights of the past year: we Love Sabrina! From our Sabrina Fair, back in October 2012. Photo by Frankie Cooksey. You're never too young to start vintage-ing! Photo by Deanna Birch at our Hand in Glove fair, May 2013. 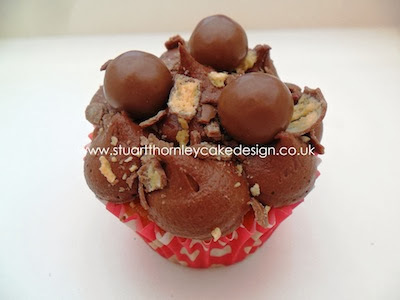 A new treat from Stuart Thornley Cake Design for this fair - the Malteser cupcake. 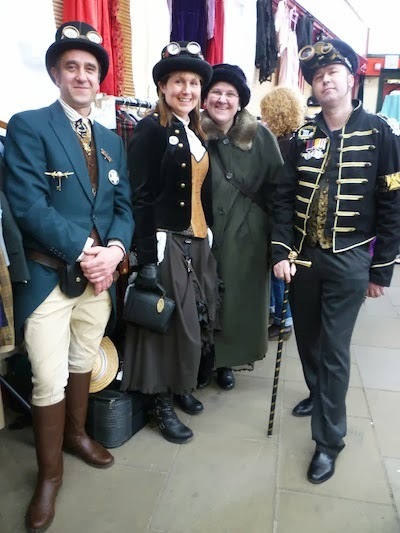 Highlights of the past year: the Cottonopolis Coglective - Manchester's steampunk elite! - came to visit our Westwood Ho! Fair in April. Photo by Deanna Birch. 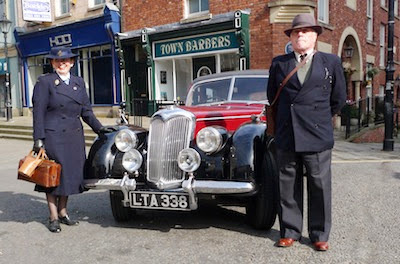 Highlights of the past year: Michelle and Bill Bridges beside this magnificent 1949 Riley RMB 2.5 litre, at our Second Birthday Bash. Photo by the proud owner, Stephen McGonigle. Suzylovesmilo - handmade clothing and accessories using new and upcycled materials; women's vintage clothing and accessories, homeware 1950s-80s. The Lost and The Found - 20th century homeware, photographs and jewellery. Vintage Emporium - vintage clothing, accessories, homeware. NEW! Vintage Marilyn - vintage clothing, handbags, china and novelty items, 1930s-70s. Walthew House - vintage and upcycled vintage jewellery, all proceeds going to Walthew House. Watch the Flowers Grow - flowers like they used to be - but better! Local, eco flowers sustainably grown and 'just picked' by my own dirty hands!